Happy almost-Thanksgiving! With the holidays around the corner, many of us are thinking about hosting people (or being hosted). We’re pulling out the decorations, whipping up our grandmother’s recipes, and trying to make everything just perfect for our loved ones. But . . . wait . . . are we really called to make everything perfect? Is that even possible? And what if . . . we’re called to something even more than that? Let’s stop into Kelsey’s kitchen for some answers. After the guests left, I started putting dishes away, packing up leftovers, and finding lids for jam and jelly jars. As I found the appropriate lid for the strawberry jam, I looked inside to see a white substance along with the red. Immediately, I thought that butter had somehow entered the glass jar. But then it hit me: I served moldy jam. Moldy jam. I felt my cheeks warm and my heart race from embarrassment. Questions flooded my mind: Did they see? How could they not? What were they thinking? What was I? How could I not realize I was serving moldy jam? Whenever I hear a discussion on the topic of hospitality, my mind travels to the stories of epic failures on my part to host people. In fact, in light of Pinterest, the thought of throwing a party for a group gives me anxiety. Praise God we’re not commanded to be the most creative party planner. It’s a gift, no doubt, but not a command. Instead, God directs Christians to show hospitality. And not simply to be hospitable, but to be generously hospitable—to those within our comfort level and to strangers as well (Rom. 12:13; Heb. 13:2; 1 Peter 4:9). As Christians, we have been given abundant grace through Jesus. This grace saves us from our sinful natures and the path of destruction the inherited nature leads to. In 2 Corinthians, Paul tells us that God has the ability to “make all grace abound to you, so that having all sufficiency in all things at all times, you may abound in every good work” (9:8). In this verse, we’re reminded that God lavishes His grace upon us. The grace isn’t simply enough to scrape by but an abundant amount that spills over. This same lavishing is found in Ephesians 1, as Paul expounds on our spiritual blessings in Christ. Through this gift of grace, our lives reflect the One who gives it as we extend grace to others. And one way of doing this is by extending ourselves through hospitality. In fact, the God who inspired the writers of the New Testament to instruct believers to show hospitality is also the God who instructed His chosen people to care for the sojourner, reminding them that they too had once been sojourners in Egypt (Ex. 22:21). God’s care for the weak and vulnerable extends to the vulnerable sojourner. Several times throughout the Old Testament, we see God reminding His people that He loves sojourners, providing for them in very practical means by giving them food and clothing (Deut. 10:18). As people of God, our lives are a reflection of His grace, welcoming outsiders into His fold (John 10:16). And this grace is not just enough to get by, but lavish grace that is more than we could ever think to know how to ask for. Peter, knowing that hosting guests could be a burden or sacrifice, makes the point to “show hospitality to one another without grumbling” (1 Peter 4:9). Not only was the community expected to be obedient to these exhortations, they were encouraged to seek out opportunities to show hospitality (Rom. 12:13). In light of the grace God has given to us through Jesus, our lives spill over with gratitude to His gift and the ability to share that with others. While this is the joyous truth of our salvation, the New Testament writers constantly remind the early Church of the realities experienced through this gift. And through their reminders, we see that the early Church, much like the modern Church, struggled with a variety of sins. Sacrificing time, money, and comfort is not easy. Similar to how our Shepherd showed love to His sheep without demanding love in return, our sacrifices are to be done without expectation of payment, reciprocal invitations, or gratefulness. When we focus on the sacrifice we’re making, our minds can quickly become clouded with prideful resentment. Paul reminds us to “do all things without grumbling” (Phil. 2:14), to look at the Israelites’ example to us for the cost of complaining (1 Cor. 10:10–11) and to give gifts with a generous attitude (2 Cor. 9:7). Our joy in sacrificing for others directly correlates to our dependence on God as our sustenance. It is no coincidence that Paul informs us that God loves a cheerful giver in 2 Corinthians 9:7 and then reminds us that God is able to abundantly supply our needs in verse 8. Hospitality is an invitation to rest. My ESV Study Bible tells me (in its note on 1 Peter 4:8–9), that during the period of writing the New Testament, it could be a dangerous or uncomfortable situation to stay in a place where the traveler didn’t know the host. Fully understanding the vulnerability of a first-century traveler is difficult to grasp but real nonetheless. In our modern culture, with the abundance of tour guides and customer-reviewed options, travelers can generally know if they are entering a precarious situation or not. The apostles taught the early believers to look after the needs of each other, and one such practical way to look out for each other was to provide a literal place of rest. As the family of God, the new believers could offer a place of safe haven for fellow Christians. In the busyness of our lives, offering a place of safe haven for rest is invaluable. When we invite others to our home or even to a café, we are inviting them into a place of rest. Coming together as believers to experience the deep fellowship we have because of our union with Christ provides rest and nourishment for the soul in a way that other relationships fall short. Chances are, there are people in your life right now who would benefit from hospitality. There may be some who are struggling to make ends meet and would benefit greatly from sharing a simple meal. And there may be others who are experiencing a season of loneliness and would benefit from simply chatting over a cup of coffee. So where do we begin? Prayer. Ask God to show you people who would benefit from being shown hospitality. And when He brings people to mind, be obedient and seek them out. Finally, if you are preparing a meal or pot of coffee, pray over what you are making, that the time would be blessed by the Spirit’s presence and that God’s Church would be edified. If you’re in a place where the thought of sacrificing brings bitterness or resentment, take it to the Lord. We are all a work in progress, and sometimes that progress means painfully realizing that we are not where we want to be. Trust God that He will continue working in and through you. When He does, ask for opportunities to show His grace to others through hospitality. 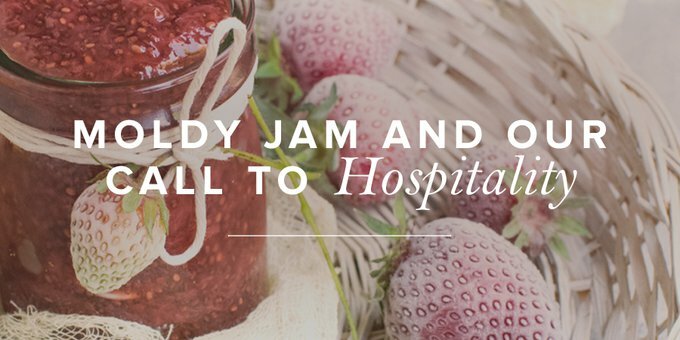 I’ve had people tell me I have a gift of hospitality and when they do, I often chuckle—the moldy jam incident, and others like it, have left stories to tell of the imperfect ways I’ve invited others to share in life. And when I recently admitted that I’d served moldy jam to my friend who was over that night, she had no idea. I smiled and quietly thanked God that even in something as small as moldy jam, He is sovereign over the fact that no one ate it.